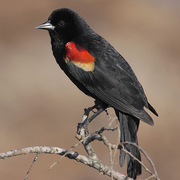 The song of the male Red-winged Blackbird is an omnipresent sound in any Washington marsh in spring. Males of this polygamous species display their colorful shoulder-patches, known as epaulets, as they sing to defend their territory, which can contain up to 15 females. Three-quarters of Red-winged Blackbirds' annual diet consists of seeds, but during the breeding season they consume larval dragonflies and caddisflies as they emerge from the water. 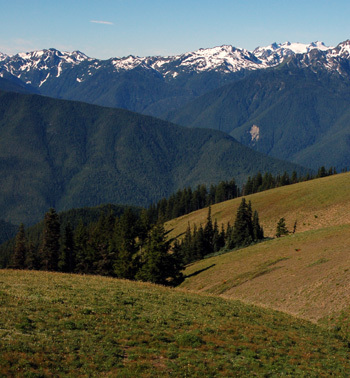 Everyone will enjoy the road up to Hurricane Ridge, but birdwatchers will appreciate opportunities to find a nice variety of birds: Varied Thrush and Pacific Wren at the Heart of the Hills campground, and Sooty Grouse, American Pipit, and Townsend's Solitaire at the summit. Vistas along the road and near the visitors center offer opportunities to spot soaring raptors.